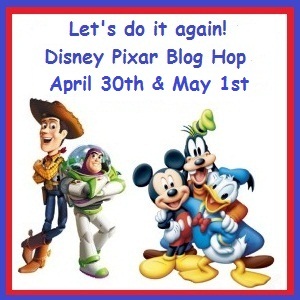 Welcome to the Second Disney Pixar Blog Hop DAY 2!!! We have a whole new group of projects and prizes for you today!! You should have arrived from Ellen's blog, but if you did not, please go HERE to start at the beginning! In case you get lost along the way, here is the Hop Order! For the first Disney Pixar blog hop, I made a Buzz and Woody layout. I am so glad I did those two first! Making Mickey and Minnie was so much easier because there were not as many pieces and colors!! I am going to show you how I used my Gypsy to make the layers of Mickey. I am making an 8x8 album, so the first thing I did was to create a file with a 8x8 square on it. I saved it and then opened it as a template. When I am making a project with lots of layers, I find it easier to open up a 12x24 mat. This can be done from the main menu (silver circle button). Here I am selecting 12x24. I opened up Disney/Mickey and Friends and picked my Mickey. I selected all of the layers (including using the shift key). They are all in my que together. When I put them on my mat, they are all blue. This means they are grouped together ~ and what you do to one, you do to all. I tapped on the 1.00 height button and sized my group to 3.5 inches. The entire group is sized together. All of the little pieces are the right proportion for my 3.5" Mickey. Then I "ungroup" the pieces and moved them all to the left half of the 12x24 mat. I change the mat size back to 12x12. Then I separate the layers by the color of paper I want to use. At this point I am not really concerned about the 8x8 square, I used that to determine the size of my Mickey. 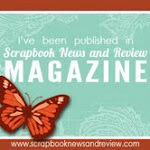 This is a great way to use up some scraps! I decided I did not need one of the shadow pieces, so I deleted it with the X button. Here is my papers all stuck down. And my pieces after they are cut out. I used my Scotch Quick-Dry Adhesive to put Mickey together. I tried to use an ink pad to tone it down, but got some blemish markes between his eyes. I found a lighter paper and re-cut Mickey's face. I glued on the new face right on top of the old one (too bad that doesn't work for people!!). Mickey will be on a page where my son will (hopefully) get a photo and an autograph. I added a border of anchors from Life Is A Beach. I also added a life preserver from Life Is A Beach. I cut out Minnie the same way as Mickey, only different red paper. This will be one of my 2-page layouts for the album. Here is my title page to the album. I had to add a Pirate Mickey page, but I used stickers! I did cut the titles from Blackletter. We will need some pages for when we are at the beaches!! This is such a different book from the previous 3 autograph albums I have completed. I am still researching things (and characters) we will see and do! And now on to the Blog Candy!!! In order to qualify for this bag of goodies,#1 please be or become a follower and #2 leave me a comment with a favorite Disney Memory. One of my favorite Disney memories is when Kramer was 9 and Tyler was 4. Tyler was super excited to get character autographs, Kramer was not. While waiting for Tyler to get some autographs, Cruella deVille came up to Kramer and said "What's a-matter little boy....you too good to come visit me?" really loud and in character. He was embarassed! Thank you for stopping by!! Your next stop in the hop is the talented Christina. This week's Fabulous Friday Challenge at Frosted Designs is Stripes & Dots. I had a hard time mixing stripes and dots. I was planning on making the catepillar all stripes, and the grass dots, but cut my striped paper (a scrap) wrong (and ruined half of the circles) and a new plan was formed!! I used my gypsy to to create this layout. I found grass from WB 2 A Garden Of Words and sized it to 6" wide. I cut four. I took some pieces of the catepillar's body and hid the letters. I welded three body sections (3 letters each) together and then welded a head on top. The head was a little small, so I sized a circle to 1.77w x 1.71h and welded it on top. I sized nine circles to 1.32w x 1.27h to put on the body of the catepilar. The grass was not long enough, so I glued it to the back of some green paper strips. I glued on the circles every other one stripes then dots. I added some green stickles around the circles and red stickles for a mouth. I added some gold gems for the eyes and antenaes. I found these clouds from Create A Critter, the sun from CM Cheerful Seasons, and the flowers from WB2 A Garden of Words. These flowers were cut from green paper for the stems. I found the word Spring from Straight From the Nest and the letters for fever from Nursery Rhyme. I copy and pasted the flowers and separated them into sections so I could cut several colors out at once. I cut off the stems from the colored pieces and glued the flowers onto the green pieces. I took the clouds and inked the edges with light blue. I flipped over a couple of clouds and used them to mask off the white part of the cloud and fill in the blue. I saved the scrap/negative piece of my "fever" paper to use as a template. This is one of my favorite parts of using my Gypsy!! I added some photos of Tanner holding a snake he found at his brother's baseball game. 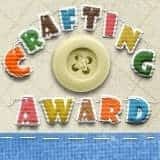 Join the fun (and great prizes) at Frosted Designs with your own card, layout or project with Stripes & Dots! Very thrifty project. I want to try one of them albums. My favorite recycled project was a stand I made for my ATG gun with cardboard from a express mail box. I had to add my bunny cupcakes in honor of Bunny Freak!!! Thank you all for your wonderful comments and your recycling stories!!! 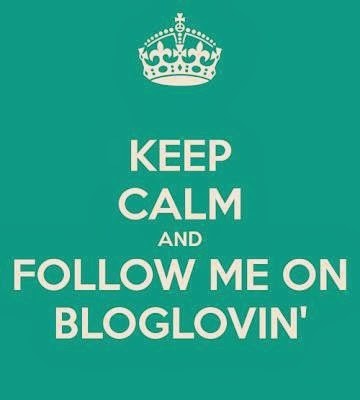 Bling and a Blog Hop! !